At any given moment, if you could trace a path over the contours of your mind, what do you think it would look like? A complex freeway system weaving around immovable concrete structures? A country road stretching across sectioned tracts of farmland? A dirt track cutting into the heart of a mountain range? At the moments I am most content, I imagine this path would appear as a white line across a quiet, open expanse. The place of Zen. The invisible highway. 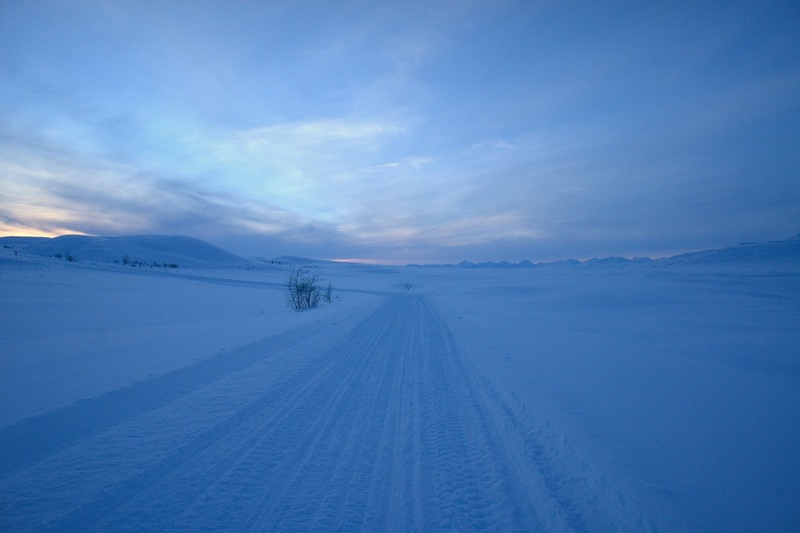 The Denali Highway is a 135-mile stretch of gravel road the connects the nowhere towns of Paxson and Cantwell, Alaska, with pretty much nothing in between. It was built in 1957 as what was then the only road access to Denali National Park, but has since been bypassed to the point that it sees almost no use beyond hunters, trappers, adventurers, and the occasional bold RV driver. After I rode a large section of the road on my mountain bike in May 2010, I had a notion that the winter experience would mimic a Zen state of mind — a snow-covered path that rolls through high alpine valleys in the shadow of the massive peaks of the Hayes Range. This year presented enough time to finally try the route during the winter, so when friends asked me about my Alaska plans, one of the first ideas I expressed was "ride the Denali Highway." One of my friends, Jenn from Whitehorse, was particularly interested in the specifics of such a tour. And because we were hoping to recreate the great times we had while riding the Dawson Trail last March, we pulled Sierra from Whitehorse and Jill from Anchorage into the conversation. It would be a grand venue for a reunion of "Pecha Kucha Mountain" — four women on fat bikes in the Great White North. Planning trips is not one of my strong suits. In fact, I'm quite horrible at trip planning. There's a reason I was initially drawn to adventure racing, and that reason is not competitive drive. I'm happy to let race directors, friends — really anyone who isn't me — plan a trip for me. But because Denali Highway was my dream, I took on the challenge of planning the tour. After feeling out and rejecting the possibility of shuttles (either a $2,000 charter flight or a 700-mile round trip drive, twice), I settled on an out-and-back to the two backcountry lodges that are open in the winter on the highway, Maclaren River Lodge (mile 42) and Alpine Creek Lodge (mile 78). Sierra only had time for a three-day trip, and I found myself saying "Oh, 80 miles is totally a doable distance in a day with good trail conditions," knowing that the fastest I've ever ridden the White Mountains 100 is just under 18 hours, which translates to a 15-hour day for 80 miles, best case scenario. Fifteen hours is perhaps a reasonable day of travel only in my mind, but I persisted with that idea right up until about two weeks before the trip, when Sierra gently suggested two nights at Maclaren with an out-and-back ride on the second day, just in case we ran into poor trail conditions. Thankfully, Sierra is smarter than I am, because committing to a lodge 80 miles from pavement would have been a disaster for our fun reunion tour. 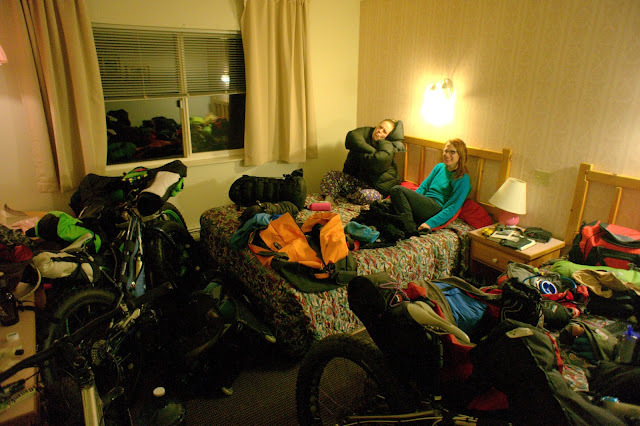 The two Jills drove from the west and the Canadians came from the east, converging at a tiny hotel room in Glennallen. The gear explosion was just the first of many bursts of giggling and debauchery. The Pecha Kucha girls were together again. Unfortunately I failed to take a picture of all of the bikes — a major faux pas in realm of fat bike trip reports. But the breakdown was a titanium 9:Zero:7, a titanium Fatback, an aluminum Fatback, and a Salsa Mukluk. 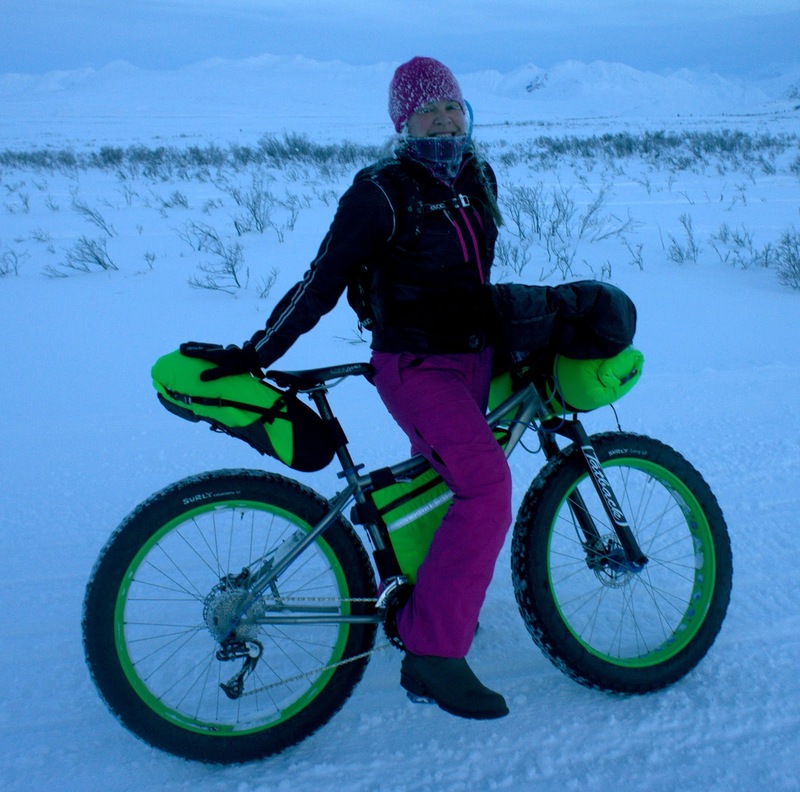 Sierra's Fatback easily won the prize for the most stylish rig, with her matching green rims and bike bags. (As in perfect matches. She actually gave the bag maker a pantone number.) Combined with her hot pink ski pants and matching hat, she was easily identifiable from long distances in the stark landscape. 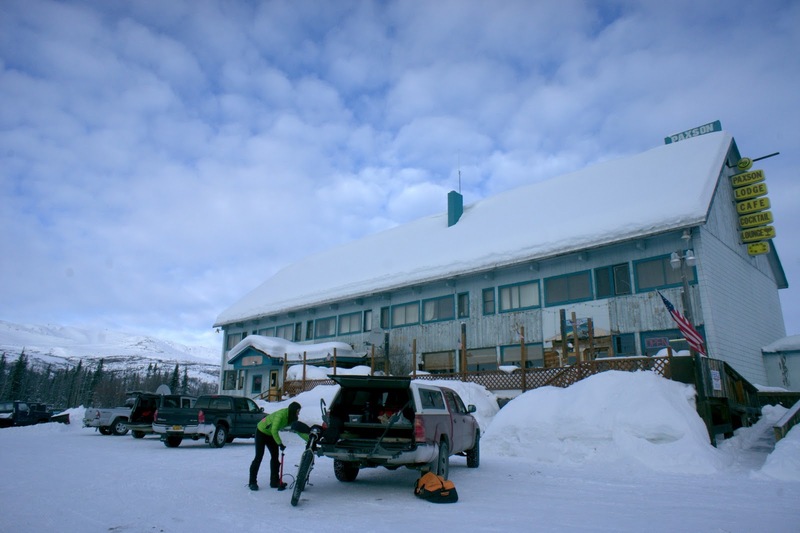 We picked a (in retrospect) rather late time to start driving to Paxson from Glennallen, and then indulged in a long breakfast and more gear packing in front of the Paxson Lodge. The bemused lodge owner peppered us with questions as he served us French toast and omelets, and shook his head when we told him we planned to ride to Maclaren River Lodge that night. "You can't ride all the way out there," he said. "You girls are going to be exhausted when you get there." We just smiled and nodded. He had no idea that we were such fine-tuned endurance athletes. Forty-two snowy miles would be easy peasy for the likes of us. The snowmobile trail crossed the spruce-lined creek beside Paxson Lodge and immediately started climbing drastically — nearly a thousand feet in the first five miles. On top of this climbing that I expected but didn't quite visualize the extent of its difficulty, the trail conditions were much softer than I expected. 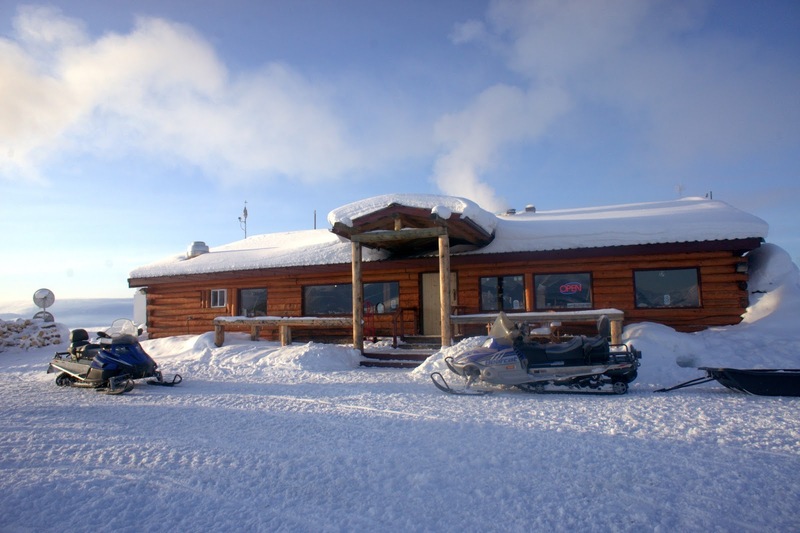 The winter lodges really only start to operate for regular snowmobile traffic in March, and it was still early enough in March that the route had only seen minimal use over many feet of soft powder. For the most part we were able to pedal through it, but our pace was jogging speed (4 to 6 mph), frequently dipping into walking speed (2 to 3 mph) even when we weren't pushing. And of course powering our rather heavy steeds through the mush was hard work — generally expending the effort level of running for the output of walking speeds. I've said before that the whole reason I found my way into trail running was because a few years of snow biking convinced me that wheels aren't always an advantage. Luckily, we were still fresh and excited for our adventure, and no one even seemed to notice the grunt of the first big climb. That is, until we started down our first big descent, only seven miles in, and Sierra noted how late in the day it was already becoming. "What's our average pace?" she asked me. "Do you really want to know?" I replied. She thought about for a minute, and then resolutely said, "Yes." "We've ridden seven miles in two hours," I said. "Maclaren Pass isn't until about mile 35 and I expect we'll have at least one big descent and another climb in there. This might be the only big descent. Or there might be more. I don't know." "So seven kilometers an hour is what we might average all day?" she asked. I paused for a second. "Well, yes," I replied. Our pace slowed even more as we rolled toward the path of a cow moose and her calf, who were intent on not leaving the trail. I'm frightened of moose, more so than I am of bears because moose are often more aggressive when they feel threatened, and less predictable. I couldn't muster the courage to approach the animals any closer. The standoff lasted for several minutes until Jill rolled up. 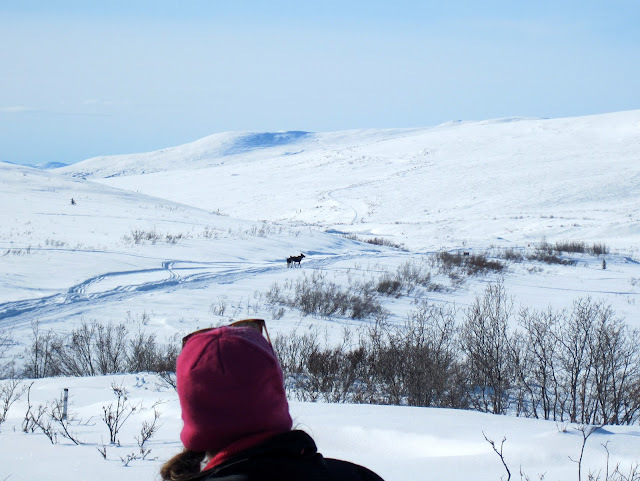 As a resident of Anchorage, she deals with moose on bike rides on a regular basis, and was much more bold about riding toward them and yelling "get off the trail!" They moved forward but continued running down the trail for about a quarter mile, stomping up the track and occasionally glaring back at us as we tried to hold a tight pack. Spirits remained high but energy begin to flag at mid-day, when after four hours we had only ridden the equivalent of a half marathon. We were just beginning what was bound to be long descent to low elevation at Tangle Lakes, which were only halfway to the lodge with another big pass in the way. Jill was feeling sick and Jenn was nervous about the pace and the fast approach of darkness. I was beginning to feel the first tinges of cold that would nag at me for the rest of the ride. The day was gorgeous — clear with temperatures ranging from the single digits to perhaps as high as 20 — and after the second big climb to 3,800 feet elevation, I was lolled into complacency and descended to 2,600 feet without wearing a hat or windshell. By the bottom I was deeply chilled, and the few minutes I spent waiting for my friends sparked that primal fear that seems to irrationally scream, "You need to start moving or you will die." This started a jostle where I would ride ahead and then stop to wait for my friends, sometimes running in place, or running laps, or doing jumping jacks to try to increase my body temperature. Nothing worked great. I shivered at times. The afternoon got late and the ambient temperature continued to fall. 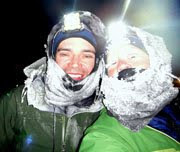 I didn't want to ride too far ahead, but I didn't feel comfortable letting my body temperature drop any farther, and didn't have many options short of crawling into my sleeping bag. As we started the third big climb to Maclaren Summit, I reasoned that as long as I could see Sierra's bright outfit in the background, we were all still close together. As the sun set, we climbed to a high alpine valley devoid of all visible life save for the occasional alder bush or fox track. As long as I continued pedaling, I felt reasonably comfortable. The silence and emptiness of the landscape, combined with the fatigue of the strenuous day, fostered a blissful serenity. At mile 31 I figured I was close to the top of the pass and stopped to wait until I could see Sierra. The light was low enough that I expected to only see a black dot on the blue expanse, but several minutes went by and I saw no sign of movement. Rationally, I felt strong and happy, but it was surprising how quickly I transitioned from blissful serenity to primal panic when my core temperature started dropping again. "Keep moving!" the fear screamed at me. "You will die!" I tried to shake it off. "You're fine. You have everything you need. You're only two hours from a warm cabin with hot food." But the fear persisted. I don't have enough experience with subzero cold to know how to argue with the fear. It spurred me forward into the growing darkness, feeling blissed out and terrified at the same time. I churned past Maclaren Summit with the last hints of twilight on the southern horizon, and began the painfully steep descent into the Maclaren River Valley. Knowing it would eventually end spurred me forward, but the screaming cold cut through everything, down to the deepest cells of my core, and I felt like I was being injected with icy fluid. If I was entirely alone or had nowhere warm to stop at the bottom, I would have gotten off my bike to run down the hill rather than ride — even though the riding was finally effortless for the first time all day. It's difficult to describe the joy I felt when I rounded the final bend and saw the profile of a building with a friendly neon "open" sign still lit up. It was an oasis of warmth and love amid the frigid desolation. My friends showed up about 45 minutes later, as they had more difficulty riding the soft trail on the descent after darkness set in, but they were able to stick together. We ordered a round of burgers and four or five different kinds of drinks each (for me: hot tea, hot chocolate, Diet Pepsi, and cold water.) Life was good out here, miles from anywhere. I have a bunch of subzero temperature experience and I don't know how to shut off that same voice in my head either. I think it's is a good thing, frostbite is too easy to get. Jill, your blog is making my bucket list very long...like 3 lifetimes long. Luv the cold, few do, you found some, very lucky. Hilarious photo of Sierra in the hotel room too. I liked the part about our endurance skills as well. Because it's so true, we were all thinking that way. And you know, it turns out we were right. We made it and it was all OK despite conditions being challenging. So the feedback I get from this is that we're all awesome. Love all your posts, Jill, but this one especially. 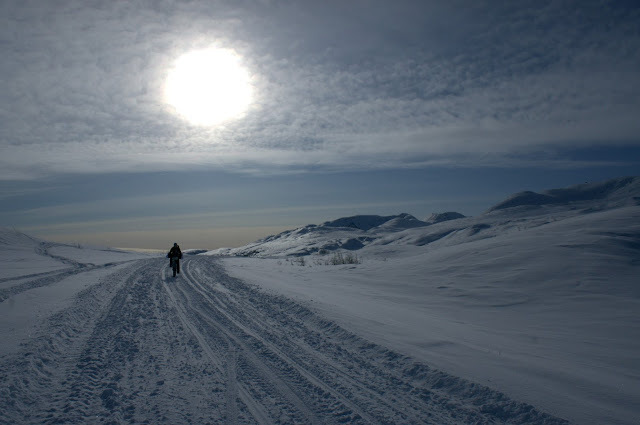 Jill, I too luv the mottled sun snowbike pic. 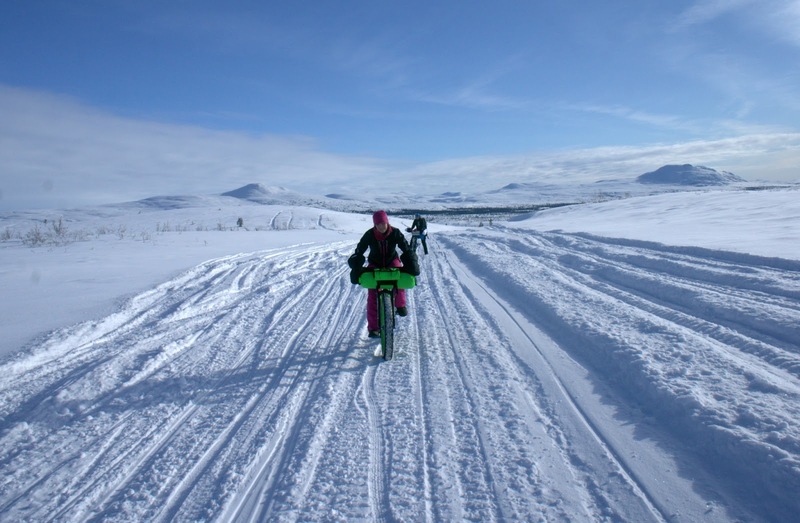 Perfect composition of good weather snowbiking. Now all the endurance skills gals need is a near white-out pic of the 4 riding into view...sorta ghost-like. The sun shot please offer it for sale. Ha! Yes to everything you said. Sounds like we had a very similar experience, except I think riding Cantwell to Paxson is the way to go! Glad you got out there. 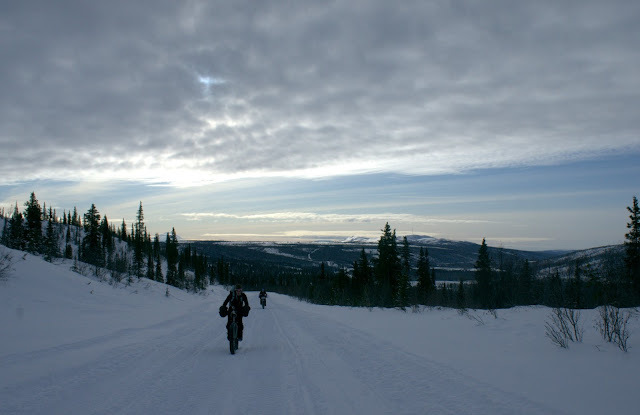 Amazing place to be in winter, on a bike! Did you have studded tires? These days I use studded Dillinger 5s. 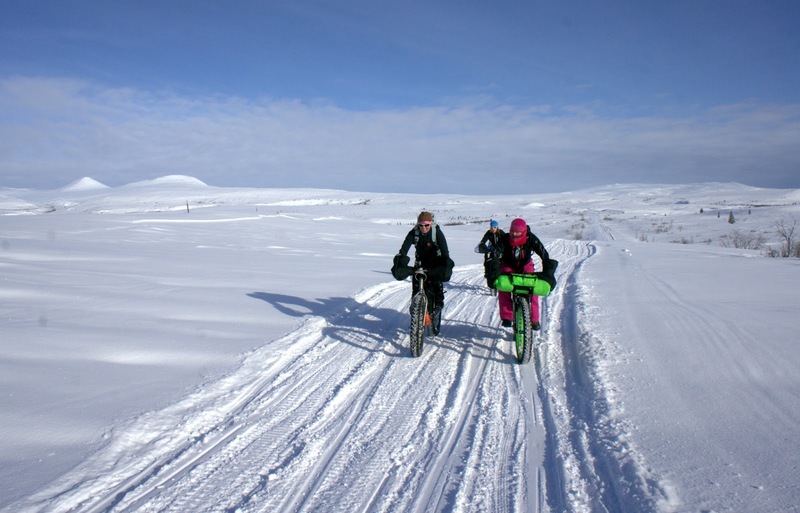 Studded fat tires weren't as readily available in 2013. Thanks, Jill. I'd like to repeat your ride on a full fat recumbent ICE trike.